Have you ever felt the feeling while hard at work that you're suddenly craving for something to eat? When you're working from home, it's easy to pop into the kitchen and dig something out of the fridge. But many of us working in large organizations will probably stay hungry and stuck on their chair till the next break or we will have to go off towards the cafetaria, snack machine or onto the street to the nearest grocery store or café. Not so at FAO's Regional Office for Asia and the Pacific! So very fittingly for an office of the Food and Agriculture Organization, there is food to share somewhere on each one of the five floors of the building. On my storey (4th floor), I'm extremely lucky to have as one of my office neighbours Mrs Tig A. who bakes a cake if not two every week. If there's no home-baked cake, there's fruit or some other pastry she bought from a trusted supplier on her desk and I'm invited to help myself virtually each time I pass in front of her. It's great! I share my own recipes with her. We're currently discussing the pros and cons of chocolate mousse as a topping for cupcakes as she was inspired by my Christmas log cake last month, which I covered up with dark chocolate mousse. On the second floor, there is a pantry with biscuits, tea, coffee and hot water. However, these are to be served for official gatherings in the meeting room 207. Anyway, there's much more appetizing food just below so I doubt anybody ever thought of picking any food there. The real treasure trove is to be found on the 1st or ground floor. 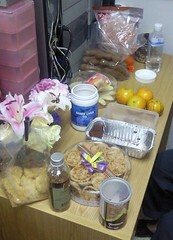 The store unit has a platter of fruits on display all the time; Registry likewise; the big finance unit office also has fruits to share; Personnel has a platter of something to eat at the front of the office, just in front of Mrs Toh V. but they also have a kettle, microwave oven and things to put into both hidden behind the corner and the desk of Mrs Arunee P.
The best for last: Cashier's office. One gets one's cheques and cash there but that is not why I'm blogging about it. Cashier is the place people congregate into to have a chat among themselves (indeed, not necessarily with the two charming cashiers Mrs Kasarin S. or Ms Orathai V.). The first thing one finds when entering Cashier is a desk and a chair. The desk is full of food for anyone to pick. There's also a Nespresso coffee machine! Some days Orathai will bring her bread machine and one finds freshly baked bread at Cashier. I think it's much friendlier than any dull room with a coin coffee-and-tea machine like those we usually find in European office buildings. I sincerely believe the sharing of food among us creates bonds and friendships that go beyond the work relationship and help strengthen the work community. There's always a place to find food and company in our Office. By the way, we also have a canteen serving food from 7.00 to 16.00. I eat breakfast there every morning; but I always stop by Cashier right afterwards. Oh Dear, just learned now that my former colleague sometimes bake bread in office!